Ambrogio and Angelo Carnevali have introduced the Carnevali 30, a very interesting boat designed by Ceccarelli, which carries on the successful yard's philosophy. Although the marketing target is well defined, the Carnevali 30 offer fittings and features usually found on larger and more expensive yachts. The yard is used to produce fast and seaworthy hulls and this model is no exception to the rule. The interior lay-out, as well, is excellent both from the habitability (two separated cabins, spacious and comfortable saloon with galley area and convertible dinette and one separated bathroom) and finishing point of views. The boat's outside lines are, in our opinion, very nice and balanced, highlighting a clear taste trend where all fittings and accessories have their logical place. The deck with a spacious sun-bathing area; the cockpit with its rational comfort and careful design, clear signs of excellent craftsmanship and accurate project work; the well conceived swim- platform with ladder, shower and direct access to the cockpit, are just few examples of the true boat's concept where a larger yacht as been adapted to as smaller hull. Performances are, without any doubt, the main characteristic of this new Carnevali 30: the top speed is remarkable and achieved with a relatively low weight to installed power ratio, while handling, seakeeping and running trim are always perfect ensuring a precise and soft ride in spite of the stern drives transmission. 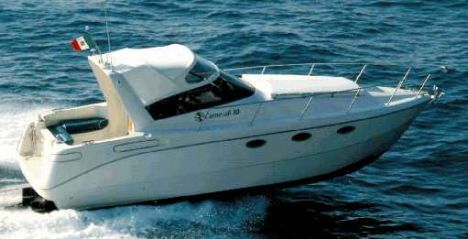 The Carnevali 30 has proved to be a small/large yacht which surely will be a leader among the renown yard's range. Construction material and detailing: fiberglass construction; double station electric windlass; 4 stainless steel cleats; deck grabrail; fore hatch; toughened glass windshield; fiberglass swim-platform; fiberglass radar arch; fore deck sunbathing area; handrail. Lockers number and place: 4/6 in the cockpit; additional storage space is available in the cabins and in the dinette area. Deck: anchor with chain, two L shaped cockpit settees, life raft storage compartment, cockpit/swim-platform passage, cockpit shower, canopy, swimming-platform ladder. 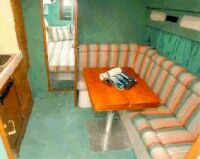 Interiors: forward cabin with double bed, aft guest cabin with double bed, galley area and dinette area amidship, separated bathroom. Steering comfort: the steering station is placed in the cockpit and it include: pilot and co-pilot seats, wheel, throttles, engine monitoring instruments and gauges, compass, depth sounder with alarm.